Multiplication math worksheets, children from 2nd to 7th grades, test different multiplication skills. 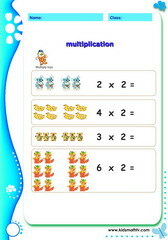 Multiplication math worksheets for children from 2nd to 7th grades to test different skills. 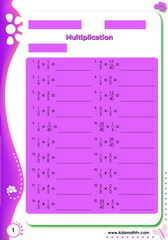 Featuring tests are on the following topics: introduction to multiplication with picture aids, multiplication expressions, multiplication word problems, multiplying multiples of ten, applied multiplication exercises and more. Multiplication tests here have answer keys attached so that parents can easily homeschool their kids with it or teachers can easily crosscheck homework. These sheets are in PDF, format, meaning they can be printed out at any time and in any quantity. 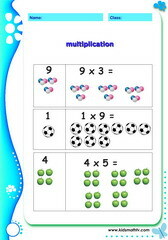 Practice Basic multiplication with this worksheet. 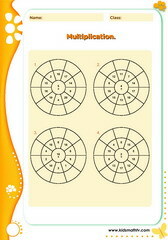 Practice Multiplication circle drill with this worksheet. 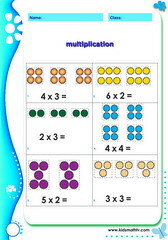 Practice Multiplication matching exercise with this worksheet. Practice Multiply 2 by 2 digit numbers with this worksheet. 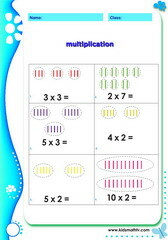 Practice Multiply by multiples of ten with this worksheet. 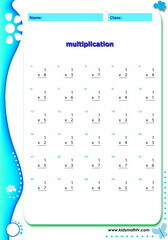 Practice Multiplication by 1 digit numbers with this worksheet. 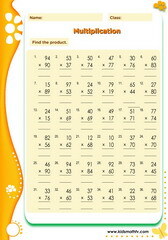 Practice Multiplication by 2 digit numbers with this worksheet. 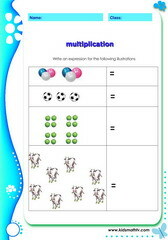 Practice Multiplication match up with this worksheet. Practice Multiplication of fractions with this worksheet. 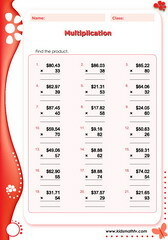 Practice Multiplication with money values with this worksheet. 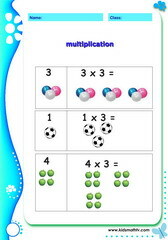 Learning your multiplication facts does not have to be hard. In fact, depending on how you look at it, this feat can be quite fun. Repetition does play a role, but knowing some cool tricks can be the difference between success and failure. So why struggle with multiplication when conquering this arithmetic operation can be yours easily? Here you get the key to mastering the most important table you will ever learn. Mastering the fundamental multiplication table is the first building block to effective multiplication skills. This table gives the product of any two numbers between 1 and 9. Knowledge of this table is probably one of the most essential things you will ever learn in school, and something that you will use for your entire life. Learning the table is actually quite easy if you have some insights into its composition and the nature of multiplication in general. Okay let's get to work. There are eighty-one possible products in the table; and you only have to care about forty-five as the remaining thirty-six can be eliminated by the commutative property. The 1-times table is simple. 1 times any other number yields that number. This eliminates another nine products, and now we are down to thirty-six. The 2-times table is quite easy and never created much trouble for students. This is true of the 3-times table as well. The 4-times table can be dealt handled with the 2-times table. For example, 4 x 8 can be thought of as 2 x 8 doubled. Since we already know 2 x 8 = 16, we need only add 16 + 16. Mastering the 4's eliminates six more products, and we are down to fifteen. Let's look at the 5-times closely. For instance, learning 5 x 6 is easy because we know our 4-times table. Thus 5 x 6 is (4 x 6) + 6 which is 24 + 6 = 30. This is how we build the table in our mind. Once the neural circuits are hard-wired, we will never have trouble with this table again. This eliminates another five products, and we are now left with ten. The 6-times table is learned as a doubling of our 3-times table. Thus 6 x 8 is double 3 x 8 which we know is 24. So 6 x 8 is 24 + 24 which is 48. We are now coming to the home stretch. Having rid ourselves of the 6's, we are left with only six products: 7 x 7, 7 x 8, 7 x 9, 8 x 8, 8 x 9, and 9 x 9. How do we master our 7's? Yes, through our 6's. Thus 7 x 7 is (6 x 7) + 7, which is 42 + 7 = 49. How do we do our 8's? Double the 4’s. Thus 8 x 9 is double 4 x 9, or 36 + 36 = 72. Finally, we are left with 9 x 9, which is 81. Now you see that learning your multiplication facts is not so daunting after all. What is more, you have been given another perspective on learning something mathematical. Although some mental energy was required to accomplish what we have done here, you can be assured that the effort will pay dividends for the rest of your life. Indeed, having mastered the multiplication table, you have taken the first step toward conquering mathematics.